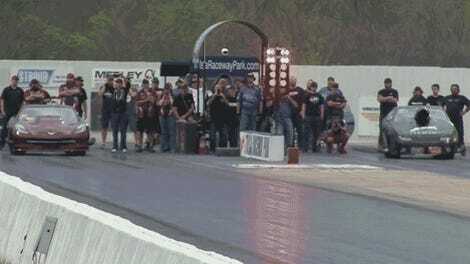 Drag racing is known for incredible speeds, and sometimes incredible mechanical failures. 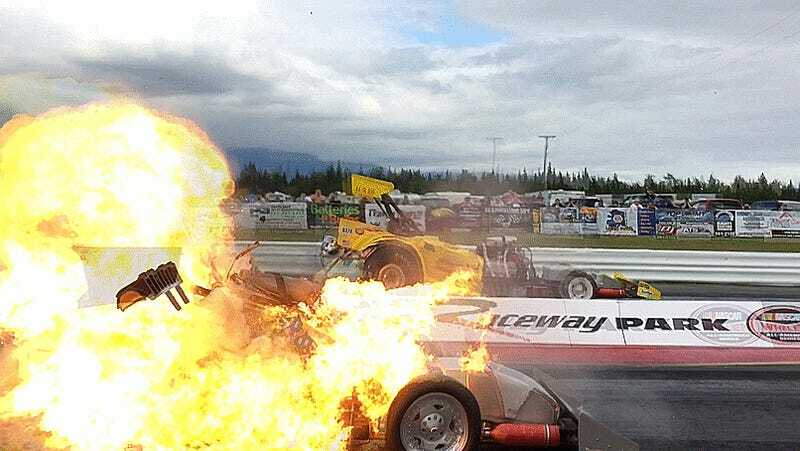 This supercharger explosion from Alaska Raceway Park nearly ended very, very poorly for the cameraman filming it. Naturally, this wasn’t fun for driver John Dixon, either, as this is an open-cockpit, front-engine Fuel Altered. Dixon lined up his “Trophy Hunter” car alongside Jamie Bodenstadt’s car named the Alaskan Grizzly. Unfortunately, as this was a July 4 race, Dixon’s supercharger decided to become the nitromethane-fueled fireworks during his second pass of the day. The supercharger blew up so violently that it overpowered the blower restraints holding it together and shot a large piece of metal at the videographer filming this video. Fortunately, both Dixon and the videographer walked away from the incident with no injuries, reports DragZine. Phew. Remember, folks: if you’re standing by the track, keep a close eye on the cars in front of you.